Businesses and organizations are encouraged to register now for the Career Connections Expo at the University of Illinois Springfield. The Expo will be held on Thursday, February 14, 2019, from 11:30 a.m. to 2:30 p.m. at the Recreation and Athletic Center (TRAC) on the UIS campus. In addition to the Expo, registered employers are invited to participate in a pre-Expo networking event known as Coffee and Conversation which will give them the opportunity to connect with faculty and staff before the Expo gets underway. 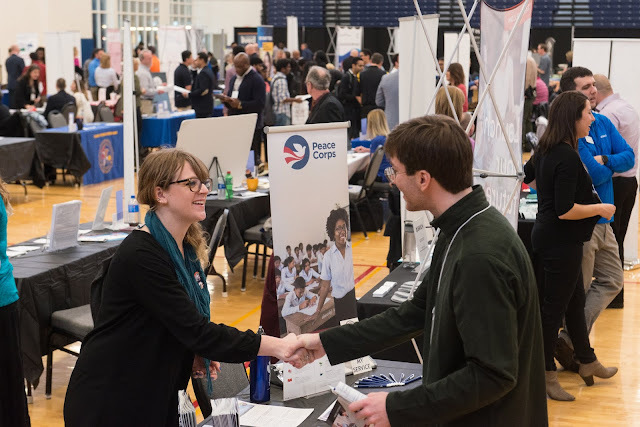 The annual event is being hosted by UIS and Lincoln Land Community College and is intended to bring students, alumni, community members and employers together to discuss career opportunities and build professional connections. Organizations who are recruiting candidates for job and internship opportunities are invited to participate in the event. The event has an average attendance of more than 300 students, alumni and community members and more than 120 employer participants. Table assignments will be made on a first-come, first-served basis. Employers are encouraged to register as soon as possible as space is limited. The preferred deadline to register is on or before February 4, 2019.